An activity like trekking will instantly give us the image of Himalayas and since it isn't very close, it might be demotivating. But luckily, South India is blessed with beautiful terrain that offers place for lots of adventure activities. If the adventure bug in you is longing to go on one such trek, then fret not! Here are some of the trekking trails for those who are living in the proximity of Chennai. These places make for a great weekend getaway and thus the ideal way to rejuvenate yourself for a new week! The ideal time to trek near Chennai is the winter months of November to February, when the climate is at its best in Tamil Nadu. Summers can be unbearably hot and it might be dangerous to trek during monsoon, especially on hilly regions. 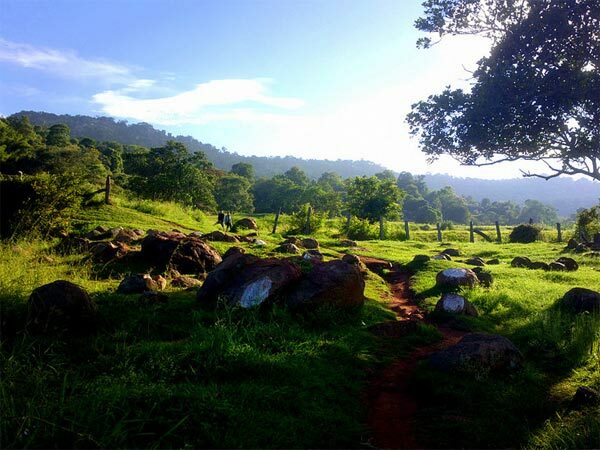 Here is the list of some of the best trekking trails around Chennai. Nagalapuram Hills is a forest region, located in Andhra Pradesh. It is nestled on the border of Tamil Nadu and Andhra Pradesh, and located about 75 km from Chennai making it the ideal destination for a weekend getaway. The beautiful forest of Nagalapuram can be trekked for either a day or two. Usually the trek can be completed in a day, but if you wish to camp in the hills then you can return the next morning. Camping can also be done near the dam, found at the trek base. Located at the border of Andhra Pradesh and Tamil Nadu, Tada Falls which is also known as Ubbalamadagu Falls, is located 92 km from Chennai. The total distance of the trek is 10 km and will take a day to complete the hike to and fro. Since it takes just a day, this refreshing trek can be your ideal adventure activity for the weekend. The trek is rewarded with the breathtaking clear waters of the Tada Falls, which is worth the strenuous hike through rocky terrain. Perched at an altitude of 3,600 ft, Yelagiri is a fantastic hill station that has been recently gaining tourist attention. This secluded hamlet is blessed with valleys, hills and charming vistas that makes for the prefect break you need from your daily routine. There are quite a few trekking destinations that are popular amongst trekkers such as the hike to Peerumedu Waterfalls or to the Swami Malai Hills. Both these trekking trails are relatively easy and short, with about 3-5 km of trek. So for beginners, Yelagiri is a good place to begin from. It is located 230 km from Chennai, which is a 4 hour drive. Located at a distance of 190 km from Chennai, Talakona is the tallest waterfall of Andhra Pradesh. A trek through the lush forest will take you to the beautiful waterfalls of Talakona. It falls from a height of 270 feet, and is a favoured trekking and picnic spot. Hiking through thickets of forest scented with sandalwood, to finally reach the mesmerising falls is an experience that will rid you of all your worries. The forest has herbs of medicinal properties due to which the water of Talakona is also medicinal. A rope walk is available at a height of 40 ft from the ground, which goes over streams and canopies. A walk through this rope walk can be an exhilarating experience! Unlike the other treks so far, trek to the Venkateshwara Hills is a 48 km journey that takes 3 days to complete. It is located in the charming forests of Sri Venkateshwara National Park, which is filled with surprises like streams of water and small waterfalls tricking through random creaks. If you're lucky, you might even get to spot the wildlife of the park! The trek begins at Kumaradhara Dam Area and ends at the National Highway near Kothapally village. If you ever need an escape into the laps of nature, this trek is the activity you need to take up! Settled at an elevation of about 4,000 ft, Kolli Hills is an off-beat mountain range that is located 368 km from Chennai. A trek on the Kolli Hills will take at least 2 days, where you get to witness the enchanting Agaya Gangai Waterfalls on day 2. The difficulty of the trek is moderate, and with a bit of prior experience, the trek should be an easy and blissful one. The trail is filled with beautiful viewpoints and rocky terrain. Yercaud is yet another serene place, that is less-explored by travelers. It is set against the backdrop of the Eastern Ghats, and the place to trek in Yercaud is the Shevroy Hill range. This "Jewel Of The East" is located 267 km from Chennai. Trekking at the Shevroy Hills is simply exceptional because not only do you get the wonderful trekking experience, but the drive through the forests and mountain ranges of the Eastern Ghats will simply leave you spellbound!